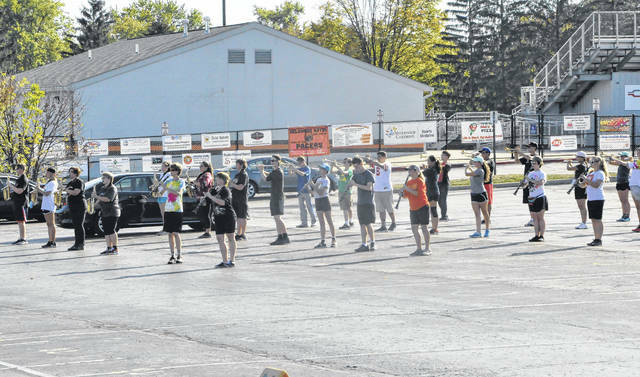 The Delaware Hayes High School Marching Band practices in the student parking lot at Hayes on Tuesday afternoon. The band recently participated in Ohio Music Education Association competitions in Louisville and Loveland, earning third place in Class AA at both events. 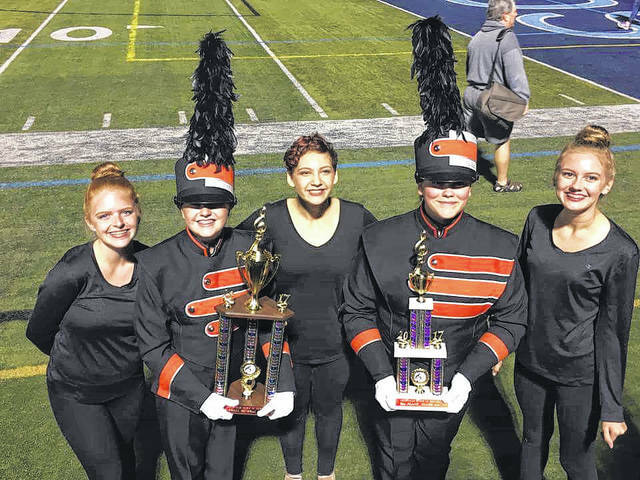 From left to right, Hayes High School color guard member Danielle Blasko, drum major Jessica Hackathorn, guard member Rebekkah Costilo, drum major Kara Hardison, and guard member Alyssa Gronwell display trophies earned at a recent competition. City of Delaware residents may get a visit from members of the Delaware Hayes High School Marching Band during their annual Tag Day event on Saturday. Beth Cline, the secretary of the band’s Cadence Club, the local band booster organization, said students in the band will divide into teams and go door to door through Delaware asking for donations for the band. School officials said the students are accompanied by an adult chaperone. The event runs from 10 a.m. to 2 p.m. More information about donating to the band and cadence club can be found at www.hayesband.com. Additionally, the band travelled to Louisville, Ohio on Sept. 16 for an Ohio Music Education Association marching band competition and earned third place out of 15 Ohio marching bands. Cline said the band’s size puts them in Class AA and said they placed third out of four AA bands at the Louisville competition. She added that the band also received a trophy for overall Best of Show for General Effect at the Louisville competition. Cline said the band also received a superior rating at the competition, qualifying them for the OMEA State Band Competition on Oct. 28 at Hilliard Darby High School. The band also participated at the OMEA marching band competition in Loveland, Ohio this past weekend, where they took home third place in Class AA. Cline said the band also received a superior rating at the competition. Cline said the band’s next competition will be on Oct. 21 in Nelsonville, Ohio. The band practices Monday, Tuesday, Thursday, and Friday for at least two hours a day after school to prepare for competitions and performing at Hayes High School football games.